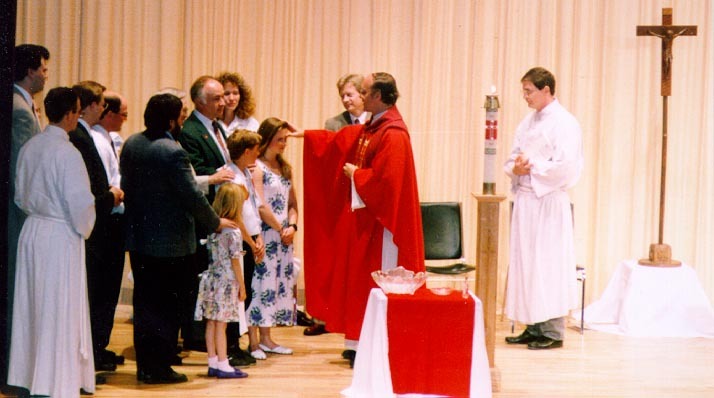 The Ray Family’s Conversion to the Catholic Church can be read here. LIVONIA, MI -It was like being moved by a process beyond his control. That was how Stephen Ray described his conversion from an evangelical Protestant to an orthodox Roman Catholic. But Ray wasn’t the only one caught up in that whirlwind. His wife, Janet, and their four children were swept along as well. The Rays never wanted to become Catholic. They never even set foot in a Catholic Church until the day after they decided to join. Janet Ray, the oldest of four girls, was raised in the Presbyterian faith. Steve Ray was the third of five children in a family that became Baptist in the 1950s. Married in 1976, the couple attended churches of several denominations along with some non-denominational churches. Eventually they stopped attending church “because of the shallowness of what we found,” Steve Ray said. In the early 1990s that business, Distinctive Maintenance Inc., an office cleaning company, was consuming much of his time. The Livonia-based firm has since matured into a multi-million dollar corporation. But Janet Ray was searching. “It was a longing that I couldn’t express for worship,” she said. When she read Thomas Howard’s book, “Evangelical is not Enough,” all her longings were put into words, she said. It was at a 1993 talk given by Frank Schaeffer (son of Francis Schaeffer) regarding his journey to Eastern Orthodoxy that Steve Ray said was the first time the door opened in their minds to there being an organized ancient church and not just an invisible church. The Rays bought every book on the ancient Church they could find and also began reading about the early Church fathers. “We found out the early Church was Catholic, it wasn’t Protestant,” Janet Ray said. “We were taught it was Protestant,” she explained. New Year’s Eve 1993 was the turning point. The Rays spent the evening with friends with whom they ended up in theological discussions. It wasn’t until the next day that his wife could say she, too, was Catholic. The first announcement they made of their conversion was to friends Al and Sally Kresta, whose family had converted to Catholicism the year before. The Krestas invited the Rays to attend Mass with them. The Rays decided to leave their children at home when they accompanied the Krestas to Christ the King Church in Ann Arbor. As strongly convinced as the couple was about their new faith, their parents and children were not. The family joined the Church on Pentecost Sunday, May 22, 1994. There were even a few members from Janet and Steve’s families who attended the service, although it was still difficult for them to accept. Charlotte Ray, 10, freely admitted, “I loved becoming a Catholic.” She also loves to argue theology with a friend. “I win,” Charlotte Ray said with a smile. Part of that evangelistic spirit must be credited to her parents, who gladly proclaim their faith and find it easy to defend if necessary. Steve Ray is currently writing Bible study notes and has written a book, “Crossing the Tiber” (Ignatius Press), which was originally intended as a letter to his father describing his reasons for becoming Catholic. It grew into a book about his family’s conversion to Catholicism with hundreds of detailed theological footnotes confirming the historical roots of the Catholic faith. According to Ignatius Press, the book is selling well and the feedback has been very good. The Rays have brought other families into the Church and intend to continue to do so.